Jayadratha, the husband of Duryodhan’s sister Duhshala, sees Draupadi in the Kamyaka forest and is enamoured by her divine beauty. 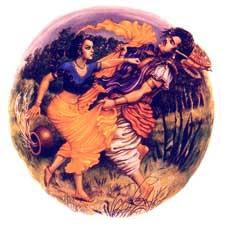 Unable to control his lust, Jayadratha tries to abduct her against her will. When the Pandavas come to know of this, they chase Jayadratha to teach him a lesson that he could never forget.